I was off work last week and I got so much accomplished for the OAL2014. I finished both my dresses and I simply adore them both. I have learned many lessons. 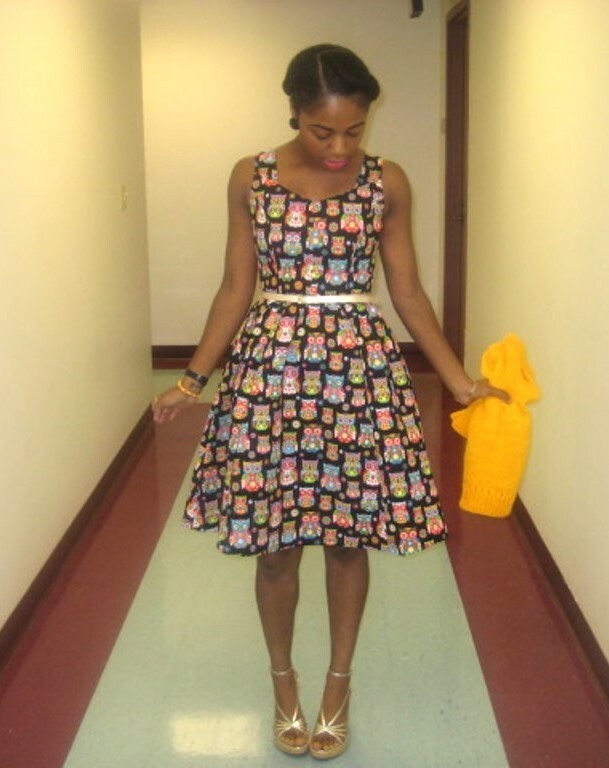 And I can’t wait to make another dress already! So, let’s talk about the first dress. 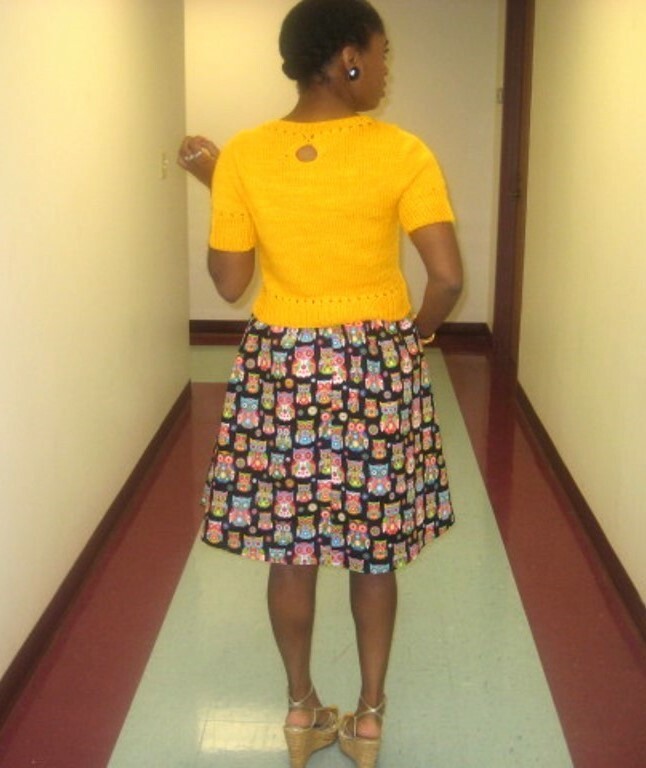 The pattern used was the official pattern for the OAL, which is Simplicity 1803. 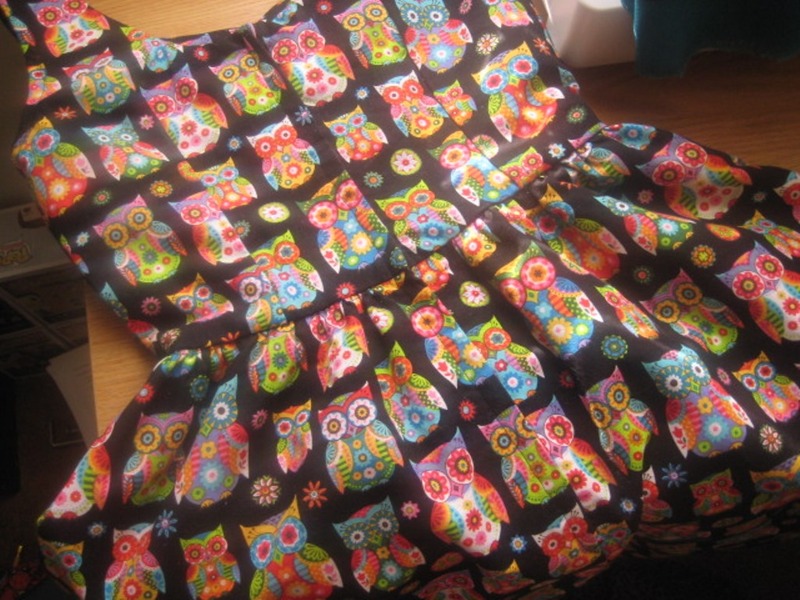 I made Bodice B for the owl dress and kept everything exactly the same for the pattern. 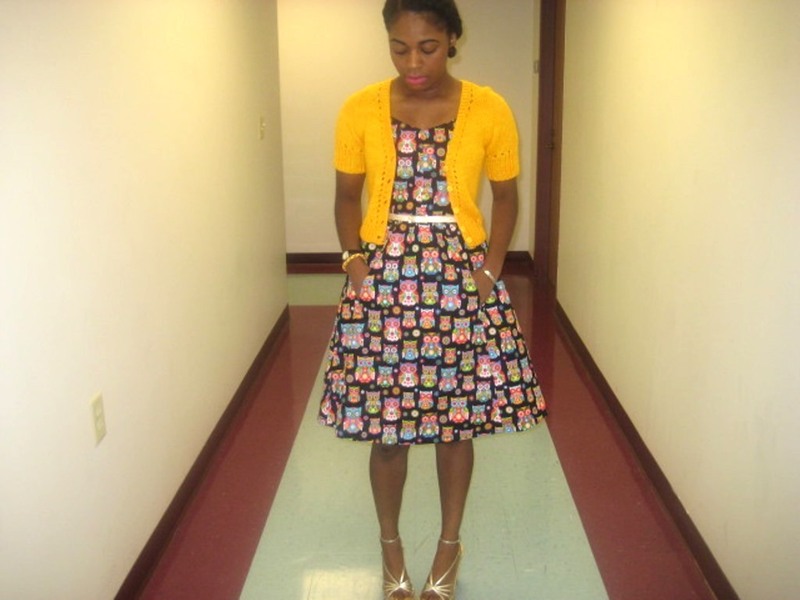 I didn’t add a tie belt or tie end to this dress because I wanted to wear belts with this dress for a contrast. This dress was started after the Marvel dress and it was not my first choice for fabric. 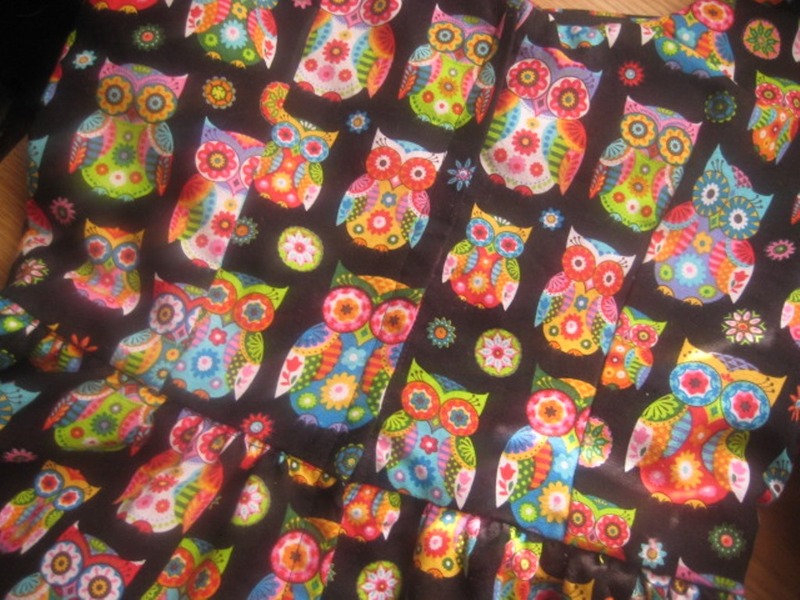 However, when Joann’s did not have the Marvel print fabric then, I went with this owl print, which I loved. I thought I would put off making a dress from this fabric for about a month or two but, I couldn’t resist the fabric and decided to make them both simultaneously. The dress was underlined with pink tulle that gives it great volume. The first lesson learned is to watch my iron setting because I definitely burned a piece of the pink tulle while make the bodice but, it was covered when I pressed the skirt seam upward. The underlining was an extra step but, it was so worth it. I would not love this dress as much if it didn’t have the underlining. The bodice was the most intense part of the dressmaking. I thought the princess seams would be a problem but LLADYBIRD explained it so wonderfully that they turned out absolutely beautiful. Also, I loved her way of making darts and my back darts are just gorgeous. I don’t think I would have been able to have such great success with the bodice if it weren’t for LLADYBIRD. I kept the bodice sleeveless because I like to wear cardigans with my dresses the majority of the time and I don’t like the added bulk of sleeves. Adding the bias tape was no biggy. It could have been a bit neater but, I still like how it turned out. I don’t really like working armholes because it is such a small area to work with and you have to be extra careful. I was praying the entire time. Since the bodice was the main part I needed help with I decided to finish the dresses by simply following the pattern. The skirt portion went by relatively smoothly. 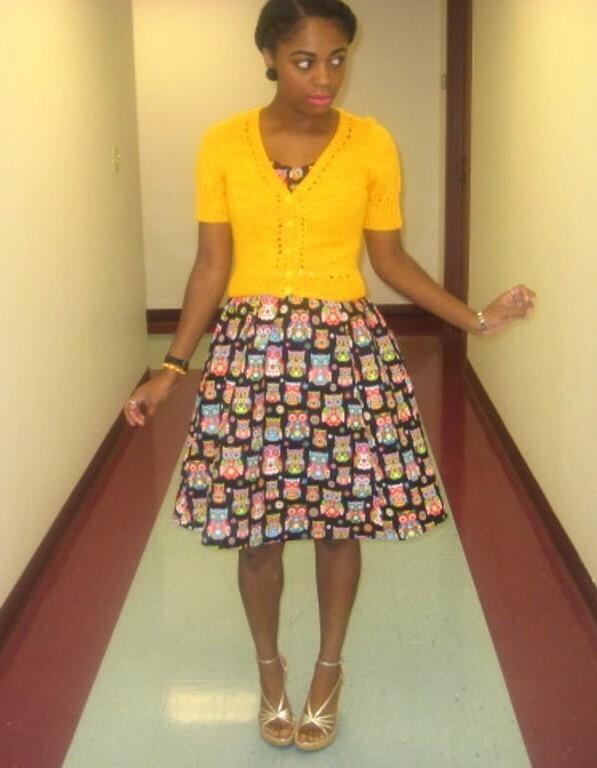 My threads did snap while doing the gathers for my skirt but, once I tried it again everything was cool. I must agree with LLADYBIRD about the pockets. They are in a kinda weird spot but, I’m not really dwelling on it. I did a narrow hem and made sure to take my time and it came out so neat. Now, let’s talk about this zipper. I really wanted to finish my dress but, I was wary of inserting a lapped zipper. Well, I found that I built it up in my mind because it was no biggy. 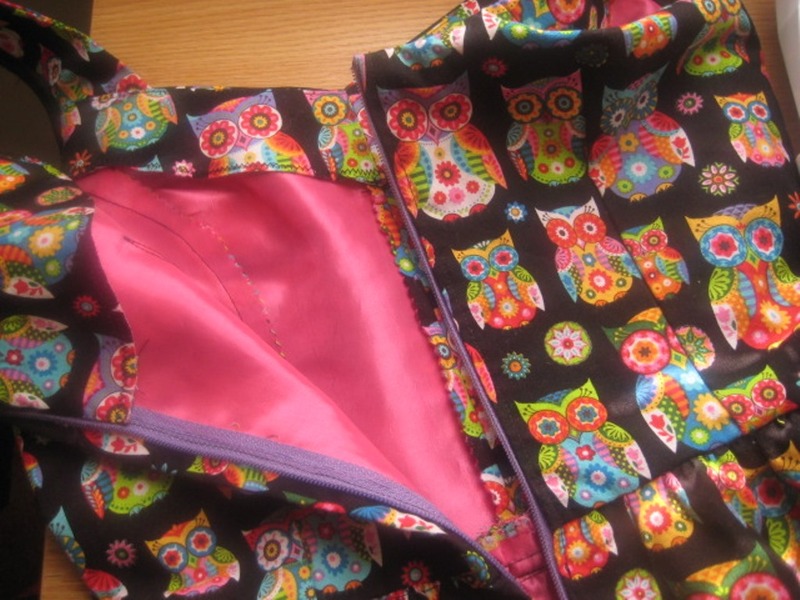 I referred to my book Teach Yourself Visually Sewing, looked at YouTube videos, and read the pattern instructions. I prayed and started the process and I love it!! I tried to make sure the zipper matched but, I see that with a lapped zipper it doesn’t really matter because it is covered. I did add the hook and eye above the zipper but, I can’t reach it by myself so, I usually leave it undone. I don’t own a serger so, I used pinking shears for most of my seams except the facing. I used the zig zag stitch on the edge of the interfacing. I was battling with my machine because my zig zag stitch would not do proper zig zags. I took it apart, cleaned it out, and changed the needle but, it still wasn’t working. I finally changed the tension and it worked like a charm. Let’s talk about the cardigan. 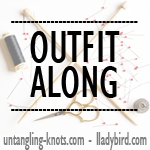 This is Myrna by Andi Satterlund of Untangling Knots. It was a very simple knit and the fit is perfect. I do feel the buttons are too small and I may change them out for larger buttons at a later date. The cardigan pops free from the buttons and doesn’t really stay closed securely. I am not rushing to change out the buttons because I very rarely wear my cardigans completely closed. They are usually open most of the time. The yarn is my favorite part of the cardigan. The color is perfect!! The yellow has orange undertones. And the yellow is so vivid. The yarn feels absolutely amazing and it is very lightweight despite it being wool. This was a very quick knit and I finished it in about a week. The yarn is Miss Bab’s Yowza in Squash Blossom. I used the suggested Size 8 needles because I did get gauge with it. The gauge was actually an errata but, I still like the fit and my measurements weren’t off according to the schematics so, the errata was not a big problem when it came to my cardigan. Your dress turned out beautifully! Well done! Nice job! 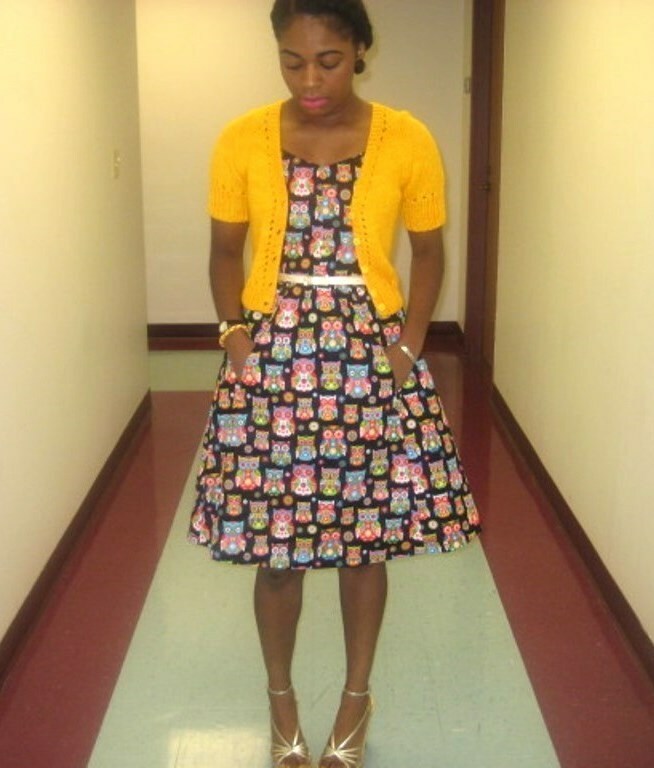 The dress and the cardigan both look great! Thank you! And I can’t wait to see your finished outfit. I’m sure when it’s done it’s going to be fabulous.